Alfred Hitchcock: cultural icon, master film director, storyteller, television host, foodie. 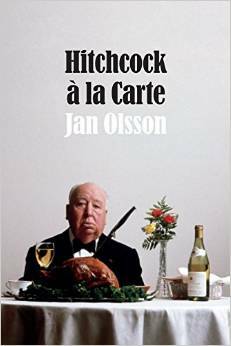 And as Jan Olsson argues in Hitchcock à la Carte, he was also an expert marketer who built his personal brand around his rotund figure and well documented table indulgencies. Focusing on Hitchcock's television series Alfred Hitchcock Presents (1955-1962) and the Alfred Hitchcock Hour (1962-1965), Olsson asserts that the success of Hitchcock's media empire depended on his deft manipulation of bodies and the food that sustained them. Hitchcock's strategies included frequently playing up his own girth, hiring body doubles, making numerous cameos, and using food—such as a frozen leg of lamb—to deliver scores of characters to their deaths. Constructing his brand enabled Hitchcock to maintain creative control, blend himself with his genre, and make himself the multi-million dollar franchise's principle star. Olsson shows how Hitchcock's media brand management was a unique performance model that he used to mark his creative oeuvre as strictly his own. 2. Smaller Screen, Bigger Brand: Hosting "Hitchcock"
Hitchcock à la Carte is a major contribution to the inexhaustible literature on Hitchcock. It locates the branding of Hitchcock in the canny promotion of his orotund and mordantly witty persona and traces how the television franchise amplified and consolidated the Hitchcock brand in an unprecedented fashion. Olsson takes us inside the Hitchcockian world in a way that few have. Alfred Hitchcock said his films were slices of cake, and his TV programs were just as tasty, offering bite-sized morsels of the affable demeanor, understated wit, and genius for suspense that made him the world's most iconic movie director as well as one of the greatest. Eloquently blending historical perspective, stylistic analysis, and cross-disciplinary criticism, Jan Olsson has written the definitive study of these quintessentially Hitchcockian entertainments.